These questions will be answered in due time. 1. New York Giants (9-7): Do I think they’re the best team? No. However, the Super Bowl champions deserve some praise until someone beats them. 2. New England Patriots (13-3): Brandon Lloyd, meet Tom Brady. You too might get along this season. 3. Green Bay Packers (15-1): There is no reason to think that the Packers won’t be as dominant in the regular season this year as they were last season. Rodgers is that good. 4. San Francisco 49ers (13-3): The 49ers surprised everybody last season and with that defense, they have a chance to come out of the NFC. The question is, can Alex Smith get them over the top? 5. Baltimore Ravens (12-4): This team was just a play away from making the Super Bowl last season. Joe Flacco showed major strides in the loss at New England. 6. Houston Texans (10-6): Had Matt Schaub been healthy, the Texans could have very well come out of the AFC last season. Schaub is back and the Texans are a major threat. 7. 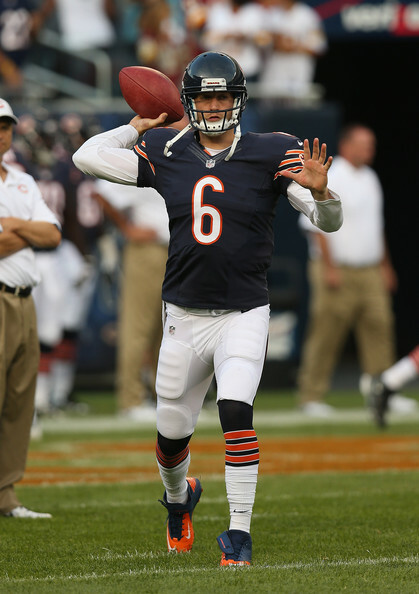 Chicago Bears (8-8): The Bears season fell apart after injuries to Jay Cutler and Matt Forte a season ago. Well, Cutler is back and reunited with Brandon Marshall. The Bears will make some noise this year. 8. Atlanta Falcons (10-6): With Roddy White and Julio Jones, you can’t count the Falcons out. Now, if Matt Ryan could just get a playoff win. 9. Pittsburgh Steelers (12-4): As long as Ben Roethlisberger is around, the Steelers will always be a threat to come out of the AFC. 10. New Orleans Saints (13-3): It will be interesting to see how the Saints offense looks without Sean Payton. I have a feeling Drew Brees will keep this team competitive. 11. Philadelphia Eagles (8-8): The Eagles finished last season on a high note, and will look to carry that into 2012. Their Super Bowl chances lie on the shoulders of Michael Vick and his health. Can he stay on the field? 12. Detroit Lions (10-6): Matthew Stafford and Calvin Johnson make the Lions tough to beat. Now it’s up to that defense and whether they can hold up their end of the deal. 13. Dallas Cowboys (8-8): This could very well be a make it or break it year for Tony Romo. The pieces are in place. He needs to deliver. 14. Denver Broncos (8-8): The Broncos upgraded from Tim Tebow to Peyton Manning this off-season and hope Manning isn’t rusty after missing all of 2011 with a neck injury. 15. Cincinnati Bengals (9-7): The Bengals were one of the biggest surprises of the 2011 season and now look to build on that. Andy Dalton needs to show continued improvement. 16. San Diego Chargers (8-8): I have a feeling Philip Rivers will bounce back this year after a poor showing in 2011. On the flip side, it’s pretty hard to trust the Chargers. 17. Tennessee Titans (9-7): The Titans will turn to Jake Locker to start the 2012 season. Good move, he can play. 18. Buffalo Bills (6-10): The Bills upgraded their defense this off-season adding Mario Williams and that will help. Can Ryan Fitzpatrick regain the magic he had in the first half of 2011? 19. New York Jets (8-8): I don’t usually take pre-season football into account, but the fact that the Jets haven’t been able to score a touchdown has to be an area of concern. 20. Carolina Panthers (6-10): Cam Newton has to try to avoid the vaunted sophomore slump if the Panthers want to compete in the NFC South. 21. Kansas City Chiefs (7-9): Adding Peyton Hillis on offense will help, and the Chiefs have the luxury of getting Jamaal Charles back. They could make some noise in the AFC West. 22. Oakland Raiders (8-8): With a full off-season under his belt with the Raiders, it will be interesting to see if Carson Palmer has improved from a year ago. 23. Seattle Seahawks (7-9): The Seahawks became the fifth team to start a rookie quarterback this season when Pete Carroll chose Russell Wilson over Matt Flynn. 24. Washington Redskins (5-11): It took awhile, but the Redskins found a quarterback. Robert Griffin III looks like the real deal. 25. Arizona Cardinals (8-8): Kevin Kolb or John Skelton? Neither of them will lift the Cardinals over the 49ers for the NFC West crown. 26. Tampa Bay Buccaneers (4-12): Why the Buccaneers hired Greg Schiano, I still don’t know. They can’t be much worse than last year. That division isn’t doing them any favors though. It’s tough. 27. Minnesota Vikings (3-13): Leslie Frazier’s job security might just be in the hands of Christian Ponder. This is a big year for both of them. 28. Cleveland Browns (4-12): Is 28-year-old rookie Brandon Weeden the answer in Cleveland? We’re about to find out. 29. Indianapolis Colts (2-14): Colts fans get to transition from Peyton Manning to Andrew Luck. Poor Indianapolis. P.S: I’m high on Luck, just like everybody else. 30. Miami Dolphins (6-10): The Dolphins don’t have many weapons on offense and have given the keys to rookie Ryan Tannehill. It could be a long season. 31. Jacksonville Jaguars (5-11): Something about having Blaine Gabbert as the Jaguars starting quarterback is not too exciting to me. It’s also not too exciting when your best player, Maurice Jones-Drew is holding out. 32. St. Louis Rams (2-14): Hiring Jeff Fisher will be a good start to put the Rams back on the map. This year is about Sam Bradford though. They need to see major strides out of the former number one pick. This entry was posted in NFL and tagged Aaron Rodgers, AFC, Alex Smith, Andrew Luck, Andy Dalton, Arizona Cardinals, Atlanta Falcons, Baltimore Ravens, Ben Roethlisberger, Blaine Gabbert, Brandon Lloyd, Brandon Marshall, Brandon Weeden, Buffalo Bills, Calvin Johnson, Cam Newton, Carolina Panthers, Carson Palmer, Chicago Bears, Christian Ponder, Cincinnati Bengals, Cleveland Browns, Dallas Cowboys, Denver Broncos, Detroit Lions, Drew Brees, Green Bay Packers, Greg Schiano, Houston Texans, Indianapolis Colts, Jacksonville Jaguars, Jake Locker, Jamaal Charles, Jay Cutler, Jeff Fisher, Joe Flacco, John Skelton, Julio Jones, Kansas City Chiefs, Kevin Kolb, Leslie Frazier, Mario Williams, Matt Flynn, Matt Ryan, Matt Schaub, Matthew Stafford, Maurice Jones-Drew, Miami Dolphins, Michael Vick, Minnesota Vikings, New England Patriots, New Orlean's Saints, New York Giants, New York Jets, NFC, NFL, Oakland Raiders, Pete Carroll, Peyton Hillis, Peyton Manning, Philadelphia Eagles, Philip Rivers, Pittsburgh Steelers, Robert Griffin III, Roddy White, Russell Wilson, Ryan Fitzpatrick, Ryan Tannehill, Sam Bradford, San Diego Chargers, San Francisco 49ers, Sean Payton, Seattle Seahawks, St. Louis Rams, Super Bowl, Tampa Bay Buccaneers, Tennessee Titans, Tim Tebow, Tom Brady, Tony Romo, Washington Redskins, Wesley Kaminsky. Bookmark the permalink.